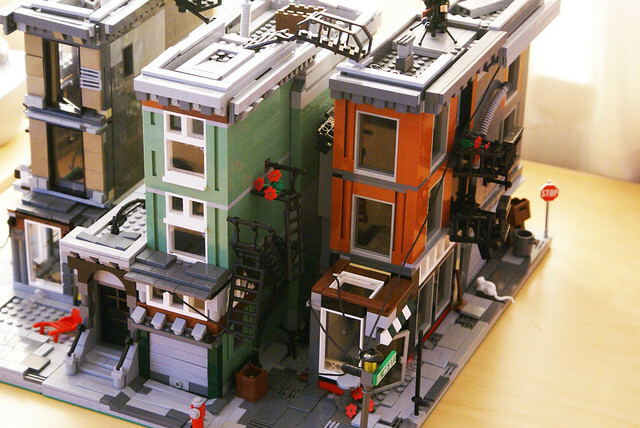 Brick Town Talk: One Man's Trash - LEGO Town, Architecture, Building Tips, Inspiration Ideas, and more! Detroit, Michigan- (BTT) With the tough economic times that hit the United States, and the world recently, some places weren't hit as hard as Detroit. With a city built around the automotive business, major bailouts of the main automotive makers doesn't bode well for the city. This MOC, built at the beginning of the economic crisis, this MOC produces a perfect image of abandoned buildings, or those on their last legs. The cracked sidewalk,broken fire escapes, and downed power lines are all great details of decapitation, but through all of the gloom, a few bright spots shine out. A couple of beautiful flowers seemed to have been able to get a new lease on life in the cracks of the dying buildings.